writes Lorine Niedecker in the entirety of “Poet’s work,” one her more commonly recognized poems. 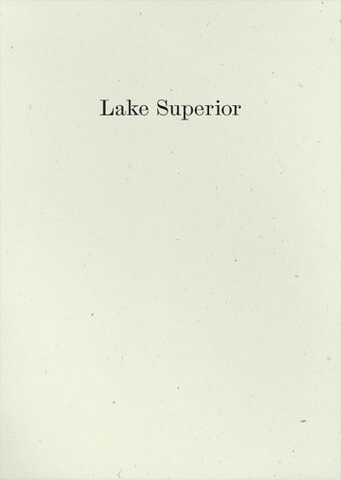 Wave Books’ release of Lake Superior attempts to unearth the raw material buried in Niedecker’s records and lend insight into how these archives were compressed by the force of her pen. The book opens with the title poem, chiseled to six pages in this edition’s generous lineation. The poem itself is spare–mostly unpunctuated and numbering under four-hundred words with lines rarely exceeding five–but its honed structure leads the reader to allusiveness and juxtaposition. the poem opens, offering a guide to the subsurface topography. Placing “minerals” and “blood,” non-living and living, on the same line is hardly a move one could make by accident. Sure enough, in the subsequent section we are introduced to “Iron the common element of earth / in rocks and freighters” and descriptions of those cargo ships, “coal-black and iron-ore-red / topped with what white castlework.” Where we might expect blood to follow iron, we receive “rocks” and “freighters,” all means of transporting metals, just with different durations in mind. To then point to the “coal,” formerly living materials, the blood-red iron, and “white castlework” reflects both the geological strata and the human history of construction. Religious re-burial? Secular matter? Because time and space press down continuously, answers aren’t readily available. As for Joliet, he is noted as coming upon a “paddlebill / come down from The Age of Fishes”, a late Cretaceous specimen, having “conversed in Latin / with an Englishmen,” a bridge of a few thousand years, and to have received a free funeral ceremony after disappearing himself, since he “played / Quebec’s Cathedral organ / so many winters”, a span of seasons. Schoolcraft’s major mark on the poem is to be introduced amidst great theatrics and fanfare, only to give the various sites quotidian names and then disappear into the more vivid and precise language of the land, into awe and reverence of the marks made by waves both past and present. Ultimately, the poem lands in a place neither certain nor uncertain. One final peculiarity to serve as a marker for our passage through the rest. It positions our newfound narrator as no more alert or prescient than her predecessors, undercut by fallible memory. Yet, there is a redeeming aspect to consider in that, somewhere in this expanse of time, we have already arrived and taken the experience in. The journey of the rock is never ended. In every tiny part of any living thing are materials that once were rock that turned to soil. These materials are drawn out of the soil by plant roots and the plant used them to build leaves, stems, flowers and fruits. Plants are eaten by animals. In our blood is iron from plants that draw it out of the soil. Your teeth and bones were once coral. And extending to the more conversational: “Maybe as rocks and I pass each other I could say how-do-you-do to an agate.” The goal of the journey may be to collect samples, figures, and observed data, but the log is speckled with various asides and clips of conversation that the then-63 Niedecker was having with her husband, Albert. If “Beauty: impurities in the rock” is a given from the poem, then it is the straying from the rock-hard data where the journal shines. Conversations with Al are rendered verbatim, correcting native pronunciations, failing to read miniscule road signs, explaining glacial trajectories and the sheen on a slice of salami. The pronunciations (Manistique, “AL: The natives pronounce it MAN isty. / I: So be it.” ) are indicative of a preoccupation of language and naming which, as with rocks, undergo metamorphoses over the centuries. “The North,” Niedecker argues, “is one vast, massive, glorious corruption of rock and language.” Delight and curiosity are evident, as “Sault Ste. Marie” becomes “Soo Ste. Marie,” “Radisson” and “Groseillier” are reduced to into “Radishes” and “Gooseberry,” “bonjour” contracts into a livelier “bosho,” a river named “esprits” by the French becomes “Rum River” to the English, and the source of the great Mississippi, Itasca, is formed by combining the medial syllables of veritas caput, “true head.” Making their wide circuit around “the blue ice superior spot”, they even pass through an Ontario town that borrows from the ancient Greeks: Marathon. The book’s critical undertaking begins with an essay by Douglas Crase that occupies roughly a quarter of its pages. A fellow poet, Crase quickly proves to be a natural-born reader of Niedecker’s dense little poem. Responding to accusations in the earliest criticism of “Lake Superior”—that the poem is impersonal in placing minerals over men—Crase argues that the lithos is essential to the mythos. The poem is sublime, not in an egotistical way, but in an evolutional, placing it in a lineage with such writers as Emerson, Whitman, Stein, and Stevens. As the American writer comes belatedly to the country, often following a legacy of pillaging and disenfranchisement, there is remorse that accompanies the revelry of seeing new shores and horizons. Thus, the conflict must produce something linguistically fresh to reconcile these sentiments. Drawing from the same set of notes and his own research, the depths Crase’s scholarship can’t easily be outlined, and are too well-argued to simply replicate. He can address each adventurer and their failings, as rooted in the poem’s very turns of phrase. He has read enough geological maps to know that granite is marked with crosses, enough Longfellow to recognize how “Lake Superior” subverts the earlier narrative provided by “Hiawatha.” His arguments are adeptly shaped, of why wonder is transfigurative in this tradition and how the otherwise abrupt ending functions in its historical grounding. Crase is also skillful on the level of individual lines, perceiving and sieving significant details in the poem’s wording and operations. As a semantic example, the “Gulls playing both sides” of the second section are both seabirds, for whom nation is irrelevant, and the once-foolish explorers who gulled their own homelands by setting up shop with a rival. On the sonic level, Crase hears the echo in the Schoolcraft section of “pondy lakes” and “fond du lac,” the treaty he will help negotiate later. With this essay as groundwork, it’s not long before an intrepid reader outfitted with a reliable dictionary might go forth puzzling over etymologies, only to discover artifacts of which Niedecker was likely already aware. Re-read the “Wild Pigeon” poem within “Lake Superior” with the knowledge that “cobalt” was from the German kobold, “imp” or “demon” (poisonous to smelt and often found around silver deposits), and that “carnelian” descends from the Latin carnis, flesh. Color and character, encapsulated in a couple of choice words. “Why should we hurry / Home” becomes the dictum guiding the book’s second half, as we meander through various of Niedecker’s writings and primary sources. These selections comprise a few letters between Niedecker and Cid Corman, a fragment of a Bashō translation (also Corman’s), topical entries from the Niedecker-edited, WPA-funded Wisconsin, A Guide to the Badger State, “On a Monument to the Pigeon” by fellow Federal Writers’ Project contributor, Aldo Leopold, and further passages from Radisson and Schoolcraft’s travel diaries. Many of these are paramount to our understanding of the poem, such as the letters that illuminate her process (“I won’t be writing for awhile, and I need time, like an eon of limestone or gneiss, time like I used to have, with no thought of publishing”), the movements of her muse (“Strange— we are always inhabiting more than one realm of existence—but they all fit in if the art is right”), and her humor, in classifying the not-yet-written poem as a “magma opus.” Some of the diction and linebreaks within the Bashō—”Moon & sun are passing figures of countless generations, and years coming or going wanderers too” and “departing spring (ya / birds cry fishes’ /eyes tears”—would feel at home elsewhere in Niedecker’s accumulated oeuvre. The Leopold section provides a grandiose, though still well-written contrast to Niedecker’s mature litotes, and Schoolcraft, ending his narrative of shallows and soils at the Mississippi’s source, provides a close to the book that feels like a new opening. Others of the entries are part of the poem’s landscape, but not so native to it. Much is made of Radisson’s dubbing the region “a laborinth of pleasure,” and yet the contextual readings provided for him are far flung from that time and place. In their stead, a rather gruesome account of a conflict between sympathetic and hostile tribes which concludes with a grim, “We killed our four prisoners because they embarrassed us.” Gripping reading, to be certain, but better as a complement to Crase’s thesis than anything manifest of Niedecker’s. The WPA guide provides some intriguing apocrypha along the southwest shore of Superior, with names and anecdotes suggestive of the disparate cultures that settled the region, but seems mostly to serve as a poor surrogate for an actual map. Even so, the poem, Niedecker’s charting, and Crase’s key make the book a worthy purchase, regardless of the craftsmanship of the other souvenirs. Timely too, as the contemporary moment has us questioning our continued consumption of resources and our role as stewards of the planet we have altered to suit us. Perhaps one solution would be to consider our situation in less egotistical, and more evolutional terms. Jay Yencich is a poet and essayist hailing from the Seattle area. He received his MFA from the University of Washington and will begin PhD studies at the University of Illinois at Chicago in the fall. His poems have appeared or are forthcoming in journals such as The Seattle Review and Pleiades.